the challenge: dcf seasonal challenge spring 17 - lara and i started the dcf seasonal challenge a year or two ago – we normally buy a couple of metres of the same fabric from darn cheap fabrics each season, and each make a garment. we then reveal it on our blogs on the same day. it’s just a fun thing that we started when we realised how often we buy and sew the same fabrics (often from darn cheap). however, early during spring 17 style arc patterns released their lara jane dress (and top) pattern, named after lara - the most fantastic style arc ambassador. i suggested to lara that this challenge we both make up the lara jane using whatever fabric we liked. so this season we are doing a special 'seasonal challenge' instead. the fabric: a beautifully bright patterned silk from the fabric store. 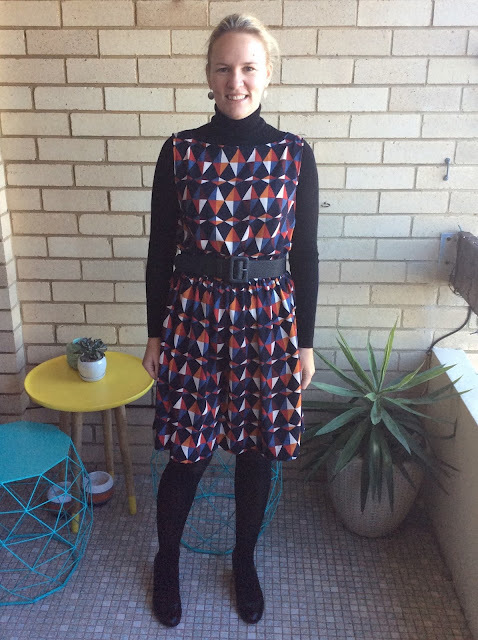 the pattern: style arc lara jane dress. i like both the dress and top versions in the pattern, but I decided to go with the top first as i think it will get lots of wear. it was also handy to make up the top first to check the general fit before making the dress. sizing: my measurements put me in size 10 for bust and between size 10 and 12 for waist and hips. i normally make a size 10 or 12 in style arc patterns. 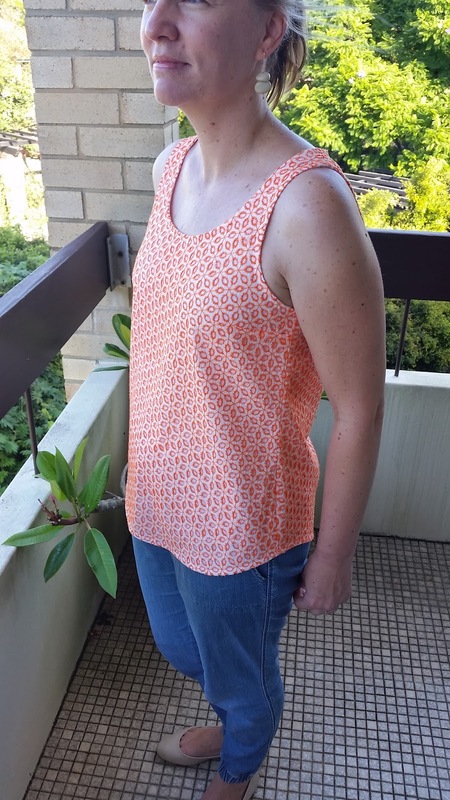 in writing this a few weeks after i finished the top i can't quite remember why, but i decided to make a straight size 10. the fit is excellent around the bust and good around the hips. i could potentially do with slightly more ease around the hips, which would be easy to fix next time. alterations: none. however for the first time ever i did check the height of the bust dart before i started, as i had just finished my first grainline willow tank which required the dart to be raised. given i didn't make a muslin i thought it best to check the height, but it was perfect so no alterations were required. 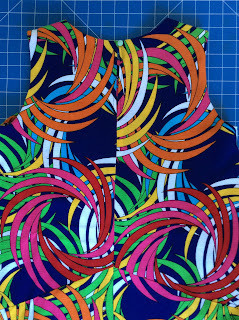 the sewing: i rarely sew with silk, but when i saw this brightly patterned silk i decided i would like to challenge myself. the silk felt reasonably stable and not too slippery when i was scoping out fabric options so i decided to give it a go. i had no problems cutting the silk using my rotary cutter and the sewing thankfully was mostly straight forward. the fabric was a little fiddly when making the sleeve ruffles and bias bindings but apart from that it behaved very well and was mostly a pleasure to sew. this experience has made me keen to try more silk fabrics. in terms of the instructions they are minimal (note: the pattern is rated 'medium'), but mostly straight forward. the one area i ran into a bit of trouble with was sewing on the arm ruffles. the instructions are written for the version with sleeves so there is not really any specific written info if you are making the sleeveless version. after confirming with lara what she did, i used the upper notch on the armhole as the place to sew the ruffle on to. the main problem is the instructions don't give any detail about at what angle / how much of the ruffle edge you need to attach to the armhole. on my first attempt i sewed one on too much and one not enough so i unpicked and re sewed them both. though in doing this my ruffle placement on the armhole slipped down a bit so my ruffles at the front are probably an inch or so below where they should be - but that doesn't cause any problems. the verdict: i love this top! i love the fabric, the fit and and the overall look. 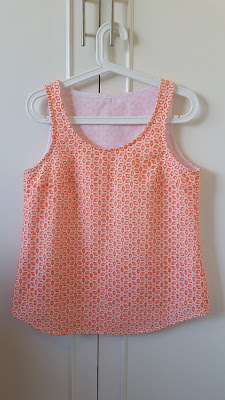 i am sure i will get lots of wear from it this spring and summer and beyond, as down the track if i like i will be able to remove the ruffles and keep a lovely simple silk tank. now to check out lara's post - i am very keen to see her lara jane! 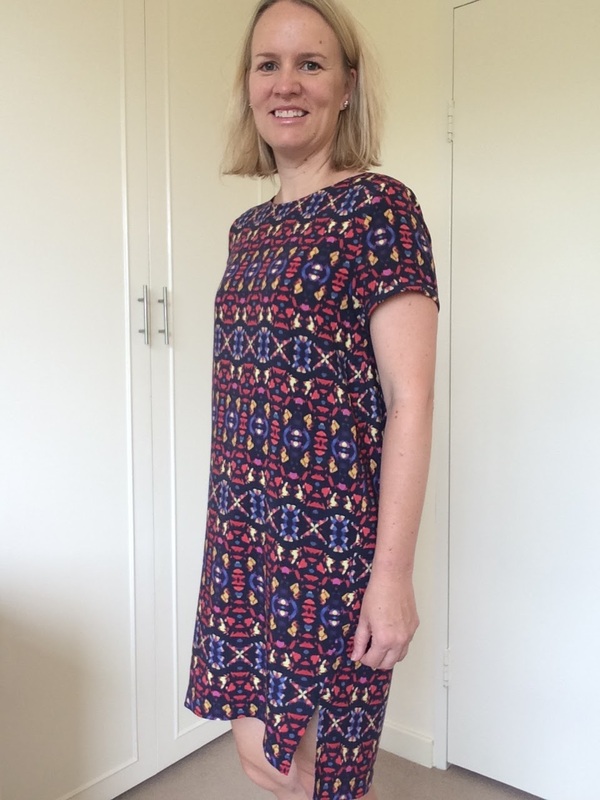 the challenge: dcf seasonal challenge winter 17 - lara and i started the dcf seasonal challenge a year or two ago – we buy a couple of metres of the same fabric from darn cheap fabrics each season, and each make a garment. we then reveal it on our blogs on the same day (or a day apart this season!). it’s just a fun thing that we started when we realised how often we buy and sew the same fabrics (often from darn cheap). the pattern: style arc estelle ponte jacket. when we agreed on the fabric i wasn't quite sure what i would make. then i went to a party and one of the guests was wearing a double sided waterfall cardi vest which i really liked. 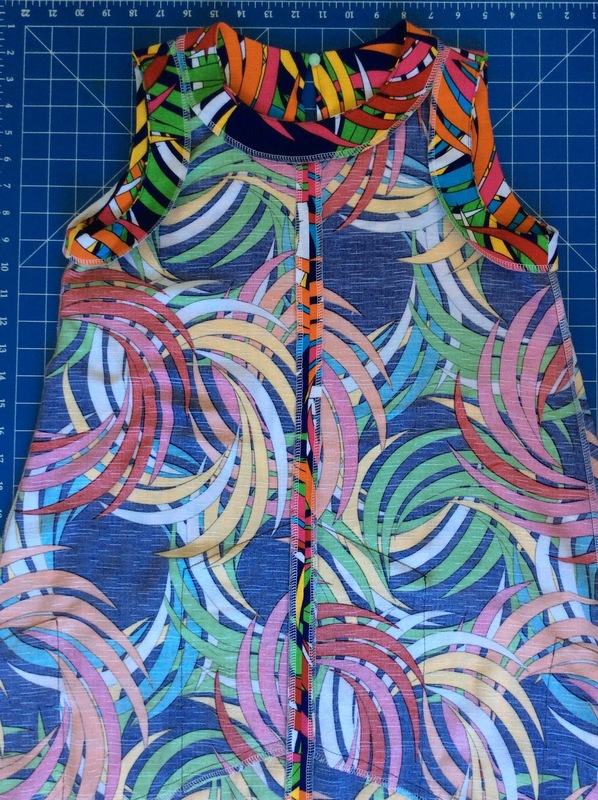 i googled looking for pattern options and decided on making a sleeveless version of the estelle ponte jacket. sizing: my measurements put me in size 10 for bust and between size 10 and 12 for waist and hips. i normally make a size 10 or 12 in style arc knit patterns, the chosen size usually relates to the extent of stretch in my chosen fabric. given the style of this jacket with excess fabric i decided to make a 10 and am happy with the overall fit. 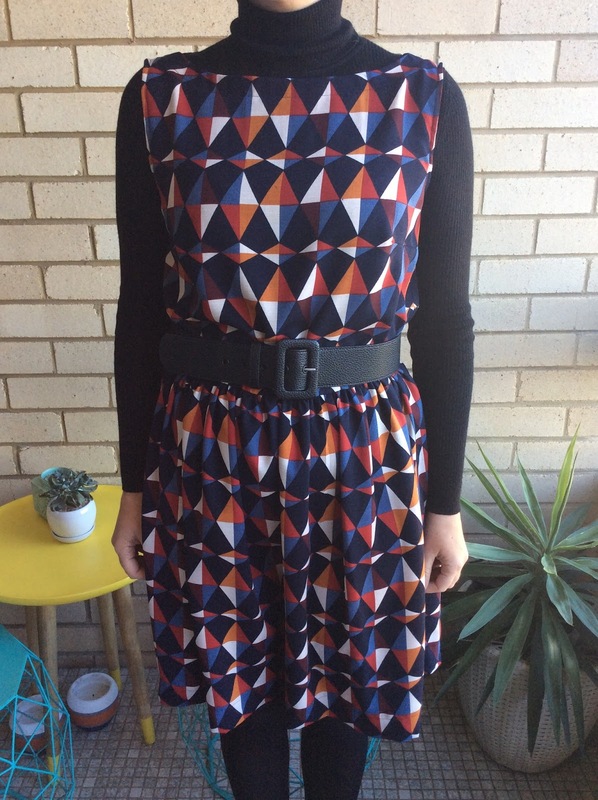 alterations: none - apart from not using the sleeves and also making a fabric tie belt. 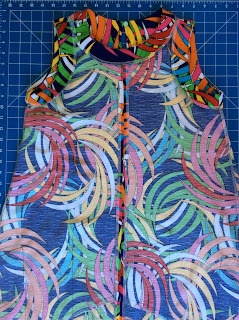 the sewing: making this a vest instead of a jacket with the edges left raw made this a very easy make. the centre back and shoulder seams are flat felled. i hadn't looked at the sewing instructions before i cut the fabric and when i saw flat felled seams in the instructions i was a bit worried that my fabric would be too think to do this neatly but it all worked out ok.
the verdict: in comparing my finished item to the pattern line drawings you will notice that my version does not really resemble the line drawings. i quickly realised during construction of the jacket that the thickness of the fabric did not allow for a flowing waterfall - see second last pic above. to compensate i made a tie belt (read: i cut a long rectangle of fabric, and left the edges raw). in using the belt i can create a waterfall type look. i really do like the look i achieve with the belt and the fabric is toasty warm so i love wearing the vest...around the house. 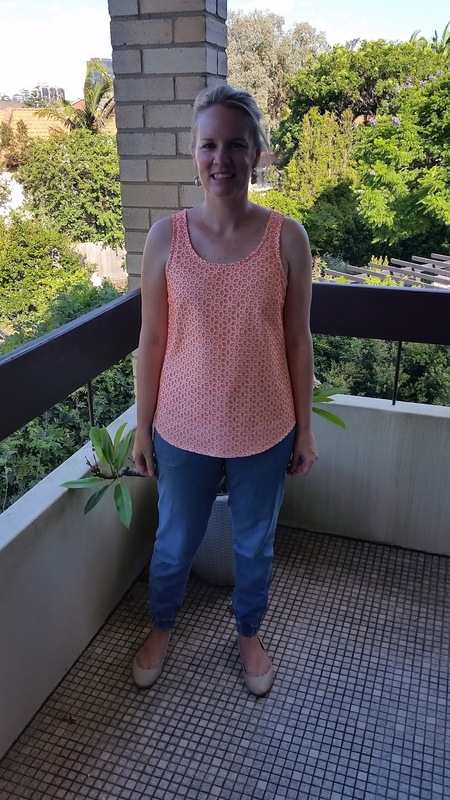 the thing is i am not really keen on wearing clothes that have to be re-adjusted regularly, so unfortunately as much as i do like the vest, it is unlikely to get much wear. if you have any suggestions on a) how I could make the look i get with the tie belt permanent or b) other pattern ideas i could reuse the fabric for, please leave them in the comments! now i need to check out lara's post. its dcf seasonal challenge time again - autumn 2017. we are posting this just into winter due to my slack photo taking, but we both had our challenge items made well in autumn. excitingly we sewed them up together when we were at sewjourn in april - see below for some pics. the fabric we chose is a fabulously fun fishy light weight linen. 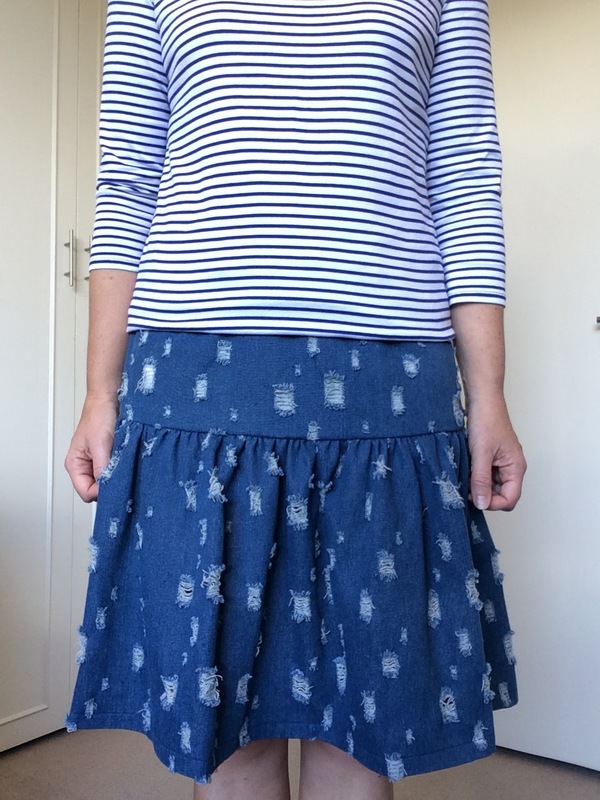 i was initially thinking a pinny, but once i got the fabric i decided to make the megan nielsen brumby skirt due to the lighter weight. 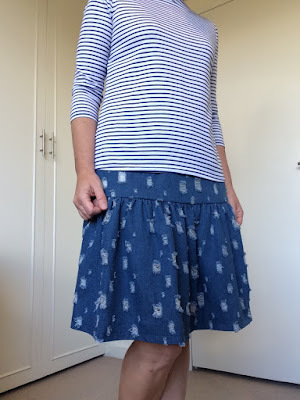 i have made the brumby skirt once before, you can check out my previous post here. i made the medium again which is a nice fit, but this time i added 3" to the length as my first version is a bit short for work. looking at the photos here though i'm not sure if its just a tad long now! i think i might take it up an inch or so. i put a lapped zip in this version (i used an invisible zip on my previous version). i hadn't used a lapped zip for quite some time so i basted it in a took my time and am happy with how it turned out. 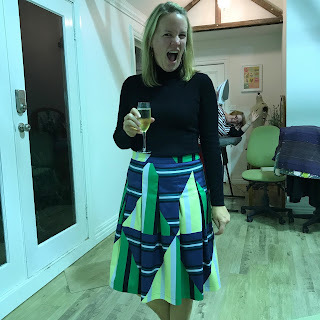 we had a great fun weekend with anna (who snapped this fab photo of lara and i at drinks o'clock) and leith and i'm already looking forward to the next sewjourn and the next dcf challenge! btw the skirt i am wearing in the pic above is stylearc candice skirt in size 12, i love the box pleats and its a great fit. the fabric is a stretch sateen mr f bought back for me from britex on one of his work trips. usually after i press publish on my post i rush to check out lara's post to see what she made. this time i can tell you its fab and you should definitely hop over for a look. *Lara and I started the DCF Seasonal Challenge a year or two ago – we buy a couple of metres of the same fabric from Darn Cheap Fabrics each season, and each make a garment. We then reveal it on our blogs on the same day. 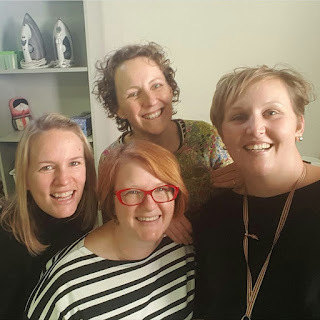 It’s just a fun thing that we started when we realised how often we buy and sew the same fabrics (often from Darn Cheap). summer in sydney has not been very pleasant this year, mostly either revoltingly hot or raining. 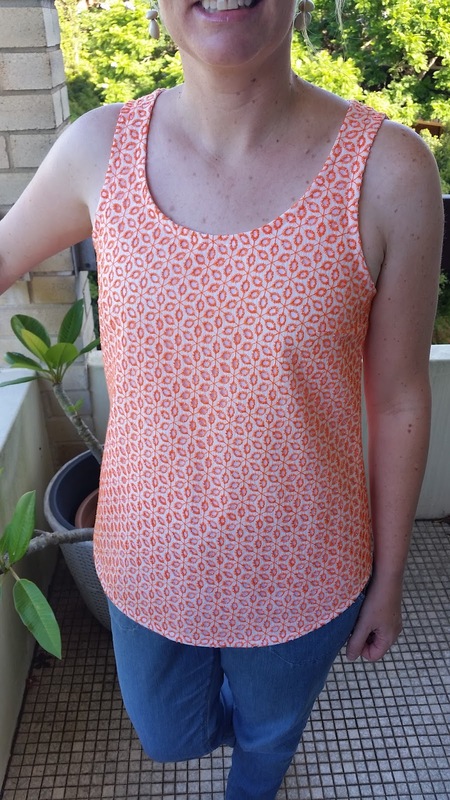 on the plus side i am very happy with my darn cheap fabrics seasonal challenge summer 16/17 make, a made by rae gemma tank. this time lara and i chose the fabric using instagram. when darn cheap posted a photo of embroidered cottons in 2 colourways, orange and red, i tagged lara and asked if she wanted to use the fabric for our challenge. we agreed to go with orange, which was actually a hard choice for me as i really liked them both. i have been wanting to make a woven tank for some time and thought the fabric would be great for this purpose. i was tossing up between the grainline willow tank and the made by rae gemma tank. i like both styles for different reasons but in the end decided to go with the gemma tank for its shirtail hem and that it comes with front pattern pieces in 2 cup sizes A/B or C/D. i made up the small size which pretty much correlates with my measurements and used the A/B cup size front piece. the fit is fantastic and the bust darts are very well placed on me. i used a white cotton voile under the embroidered cotton as it is see through. 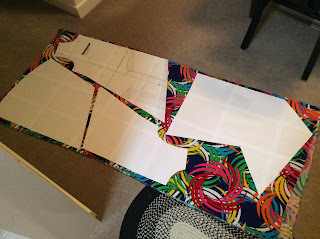 i tossed up whether to go for a loose lining free at the hem or to use the voile as an under lining. i decided to go with the underlining and fasten the voile and embroidered cotton together at the hem and am happy with how this worked out. the tank has very simple construction,but the instructions are clear and well laid out if you need them. the instructions suggest making your own bias binding for the neck and arm holes, but i bought some pre-made cotton binding making this a very quick make. unfortunately i only made this up late in summer so it hasn't had lots of wear yet, but it is very comfortable and would have come in very handy on those many 40+ days we had this summer. i am keen to make up many more woven tanks next summer and even considering using silk, which i hardly ever sew with. this pattern would be a great start to sewing with silk and doesn't take much fabric either keeping costs down. i did get a chance to wear the tank out to some wineries on the bellarine peninsula for my sister's 40th birthday on the weekend. 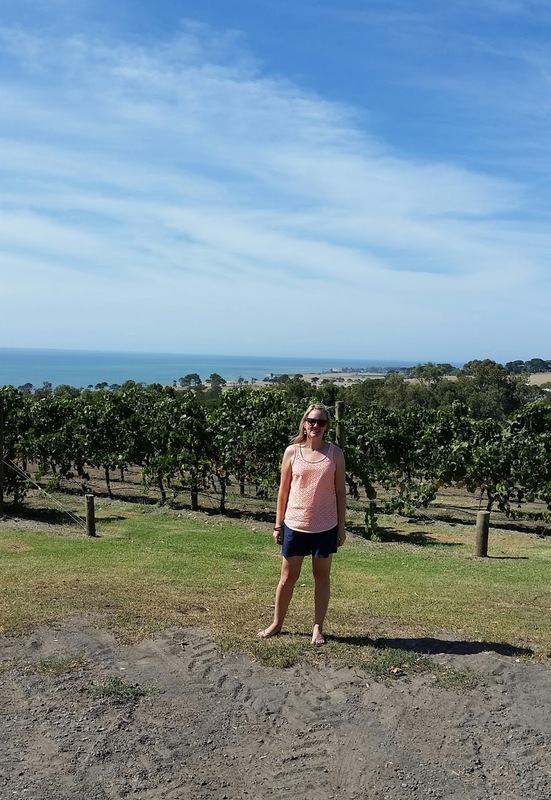 the weather was great and this top is perfect for winery hopping on a sunny day. as always i am very keen to check out lara's make, i am wondering if she has made a dress or a top? I'm guessing a dress, but you never know! 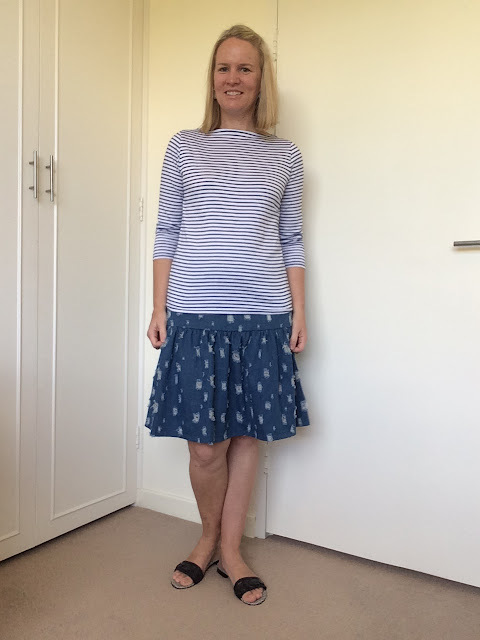 * Lara and I started the DCF Seasonal Challenge a year or two ago – we buy a couple of metres of the same fabric from Darn Cheap Fabrics each season, and each make a garment. We then reveal it on our blogs on the same day. It’s just a fun thing that we started when we realised how often we buy and sew the same fabrics (often from Darn Cheap). 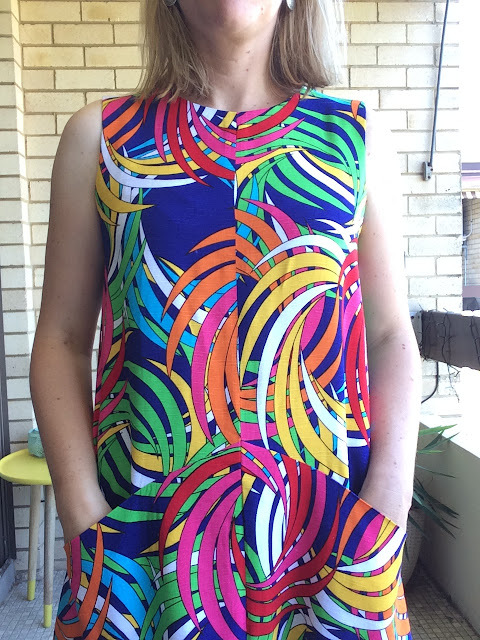 for summer 16/17 lara suggested a bright patterned viscose that darn cheap recently posted on its instagram feed. 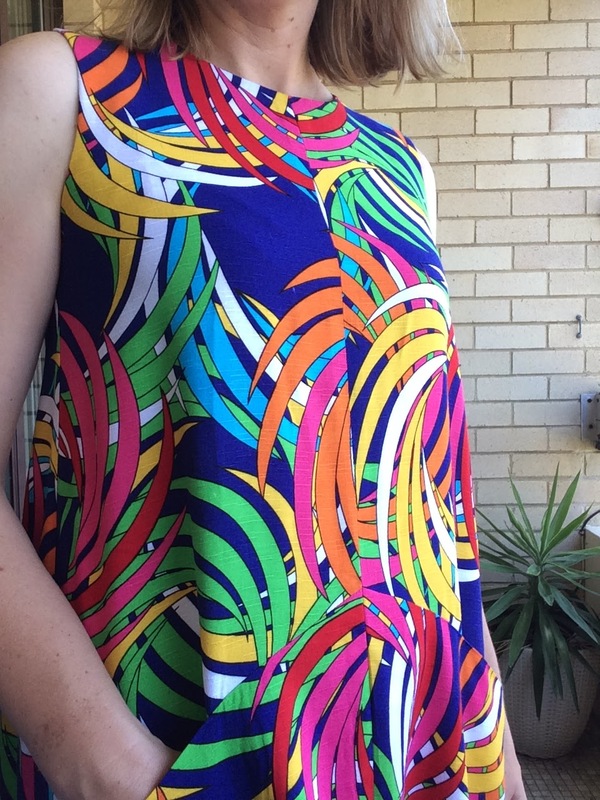 i loved the summery colours and thought the drape would be great for hot weather. i was originally going to make a vintage butterick sun dress pattern from my stash but before i had a chance to cut out the fabric grainline released the farrow pattern and i quickly changed my mind. the grainline website says farrow features an elegant A-line shape with flattering diagonal seaming concealing inseam pockets, and a jewel neckline. there are 2 versions, sleeveless and bracelet length sleeves. 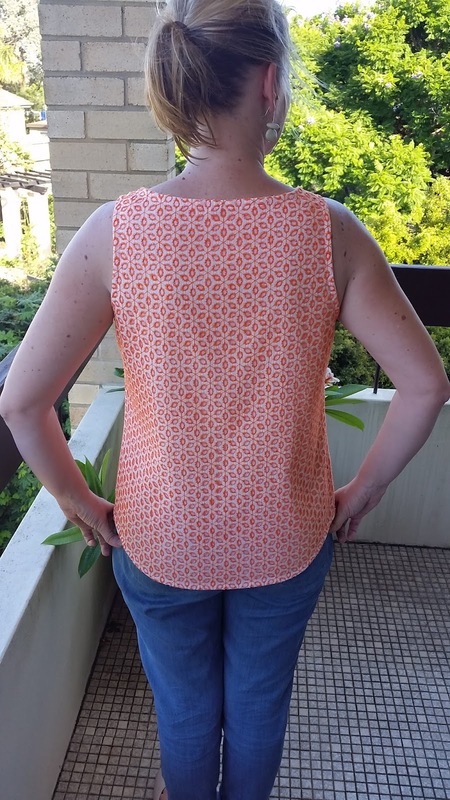 i made up the sleeveless version and think the pattern is fantastic. the drafting of the diagonal seams is perfect and certainly in my opinion very flattering avoiding a straight out tent dress. i made a size 4 in the shoulders, neck and armscye and size 0 for the reminder as i thought the size 0 looked to have enough width and swing. i like the snug fit around the shoulders and bust, but when i am making the long sleeve version i will size up to 6 for the upper part and size 2 for the remainder. the hidden in seam pockets are a fantastic design feature and very handy. i hadn't made anything with similar pockets before and so i got a bit stumped on the illustration for step 5. instead of using the diagram i just worked out what i needed to do with the fabric pieces to form the pockets. this made me realise that the diagram for step 5 is the top part of the diagram from step 4. i'm probably the only one who would get lost here, but i just thought i'd mention it here in case any one else gets confused. there is no zip, but instead a key hole opening at the back neckline. the instructions suggest using a hook and eye for the closure, after turning my sewing notion stash upside down i couldn't find my hook and eyes. to finish the dress i used a vintage button from Mr F's late grandmothers stash and some hat elastic to form the loop closure. the high low hemline is another great design feature. 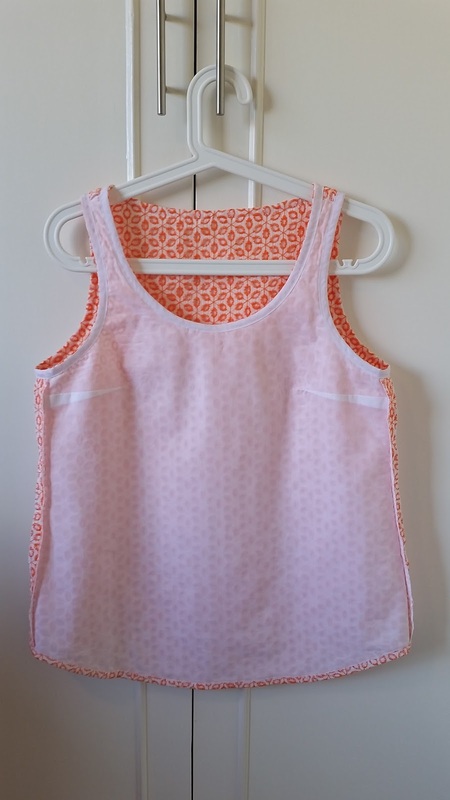 the pattern pieces all went together perfectly, making this an easy and pretty quick make. there will definitely be many more farrows in my wardrobe. i think it would be great in many fabrics - chambray, linen, and jersey would all be fantastic. i also have some kate spade silk twill in the stash that would be great too. as grainline is promoting, this dress is perfect for both casual and more formal fabrics. just a word about yardage, the pattern suggested 2 and a half yards (2.3m) of 54" wide fabric for size 4. i only bought 1.5m of the fabric, as at the time i had my vintage butterick pattern in mind. i wasn't sure if i would be able to get the farrow out of 1.5m, but it turned out to be perfect for size 4/0. the photo below shows how i laid out the main pieces. wow - its already dcf seasonal challenge* time again. i think winter has gone quickly this year for me as i have a new hobby that is seriously rivaling sewing (not quite), but we have been enjoying skiing this winter which has taken time away from sewing. now i look at my photos for this make it just occurred to me the colours are white and blue - skiing on a beautiful day! for this challenge lara sent me a message with a few fabric options for us to choose from. i knew that given my winter holiday plans it would be late winter before i had a chance to make mine up so i suggested we go with a shredded denim that would be perfect for spring wear. 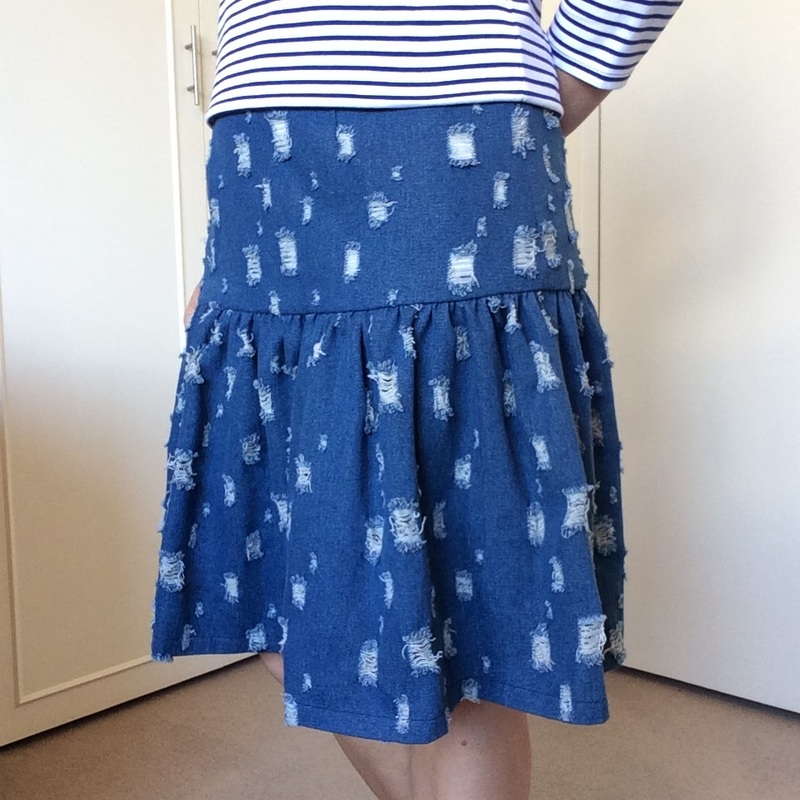 when lara sent me the image of the fabric i initially thought i would make another inari dress as i would really like a denim/chambray one but when i got the fabric it was heavier than i imagined so i decided to give mccall's 7166 a go. its a new to me pattern recently blogged by tessuti. the pattern envelop describes the skirt as semi-fitted through hips, self-lined, interfaced yokes, drop waist, gathers and invisible back zipper. when i bought the pattern lincraft only had the size 4-12 version and my measurements best match size 16. i bought the pattern anyway as i wanted to get making and i thought it would be pretty easy to size up. in a very nontechnical approach, when cutting the fabric for the yokes i added the same width as between the size 10 and 12 to the outside of the size 12. after inserting the zip and sewing up the side seams using 3/8" seams i tried on the skirt and then increased the side seam to 1.5cm below the notch - my hips never seem to match the curve of big 4 patterns. 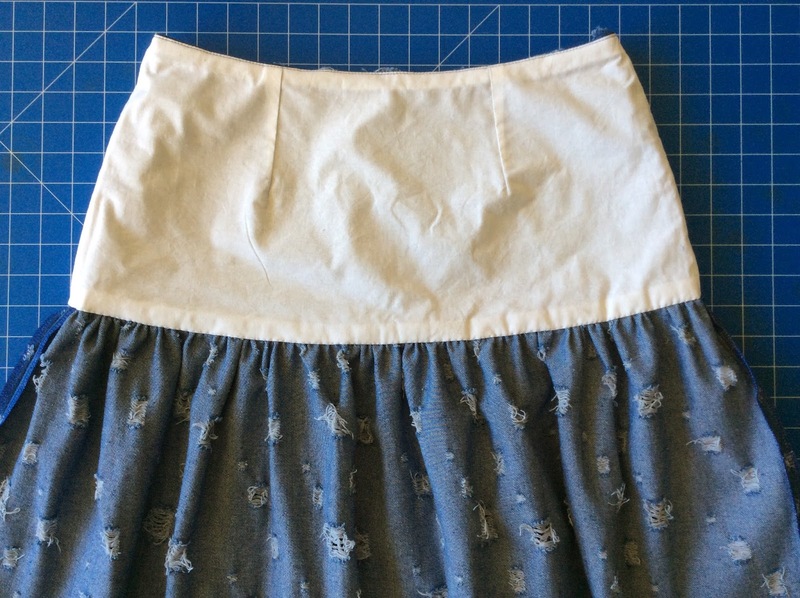 i left the width of the main rectangle for the gathered skirt the same width as the pattern. i'm pretty happy with the fit. i didn't interface the yoke as per the instructions. i lined the yoke in a white cotton which was a must given that the shredded denim is see through in parts, but i left the gathered skirt unlined given it is drop waist and the gathers bunch up the fabric. the instructions have you hand stitch the yoke lining down. initially i though i would use the machine and stitch in the ditch, but in the end i decided to hand stitch it in front of the tv and i'm glad i did, its such a nice clean finish on the inside. i cut the hem length mid way between version b (the short version) and version c (the long version). after trying the skirt on i cut a further 2" off the bottom and sewed a 3/4" hem. looking at these photos i'll probably go a bit shorter next time. 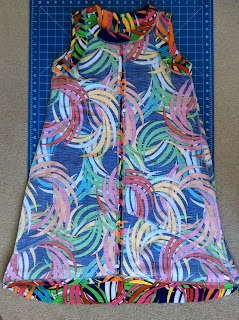 i wasn't quite sure how tricky the shredded fabric would be to sew up, but my darts and lapped zip went in ok and once they were done i thought the rest of the sewing would be pretty straight forward which thankfully it was. to go with the skirt i made a tessuti brigitte tee in some striped knit fabric i bought at fabric town, tokyo at the end of last year. i made a size 12 as it is the size that matched my measurements best. i might size down next time though as the tee is a bit big all over. the neck particularly was pretty high, noticeable in the photo below. since i took these photos i re-cut the neck line to a size 8, so the neckline does sit lower but it can still ride up. i think sizing down to a 10 next time may help this. as always, now i'm off to check out lara's make. having seen a sneaky peak on instagram i am keen to check out the design details! its dcf challenge time and its another late season post. 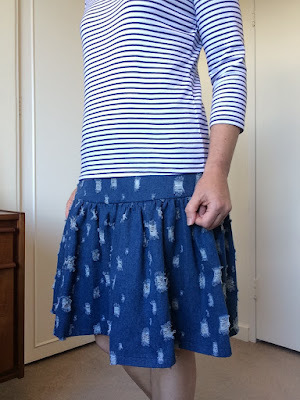 its been unseasonably warm, actually awesomely lovely in sydney lately and i have found it hard to think about sewing for cooler weather, hence the delay with making up my challenge. lara and i choose the fabric quite a while ago now. 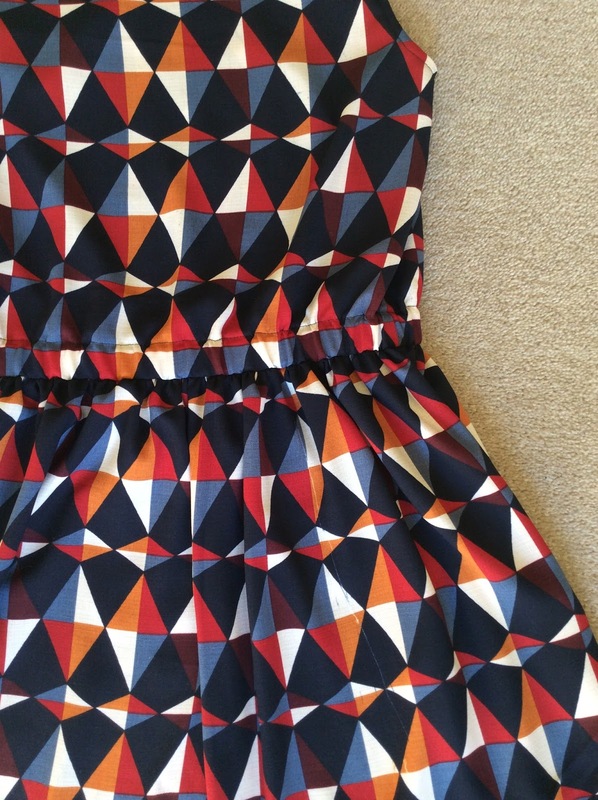 i checked out the darn cheap fabrics website and selected a few fabrics in autumnal colours and sent them to lara. 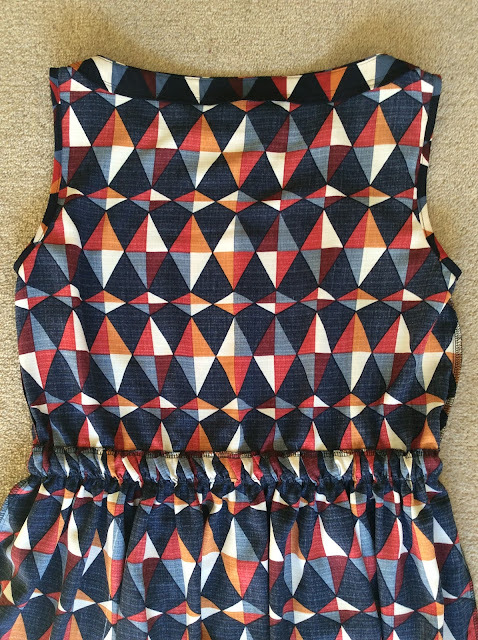 she chose a light weight poly (kind of crepe like) in a geometric print as her favourite, it was my favourite too so we were set for the autumn 16 challenge. 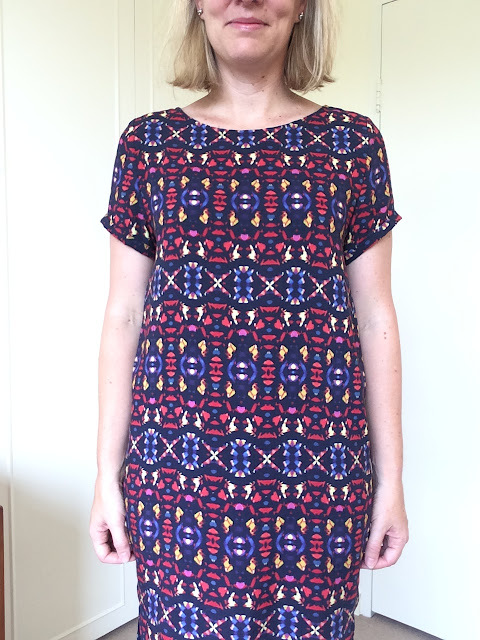 i was going to make the style arc olivia dress, but i got lazy and changed to the burda submarine dress 07/2015 #115, a pattern that i had previously printed out the pdf and taped together, but not made. 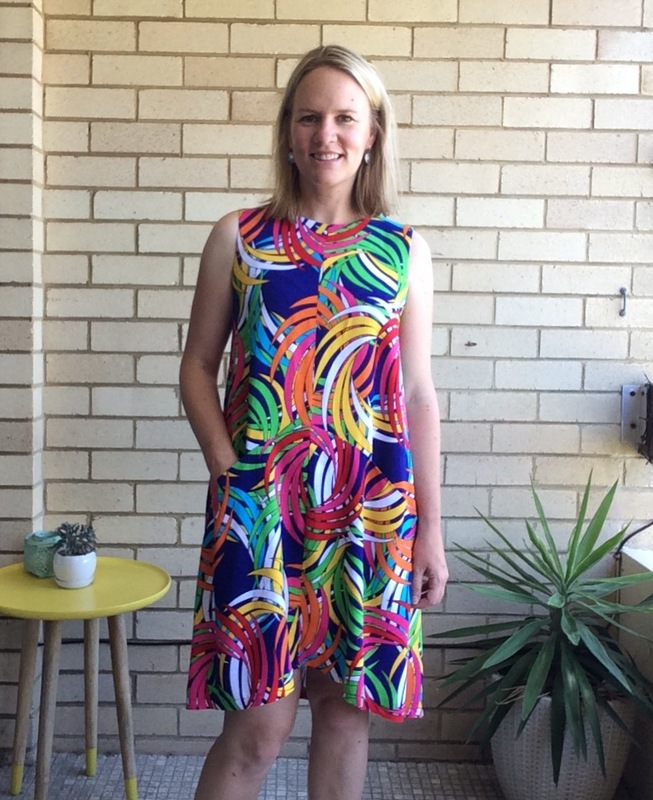 as kristy from lower your presser foot mentions in her review of this dress - its a pretty simple make. essentially its a rectangle skirt that is gathered and attached to a loose fitting bodice, with an elastic waist and a wide neckline so there is no need for any closures. 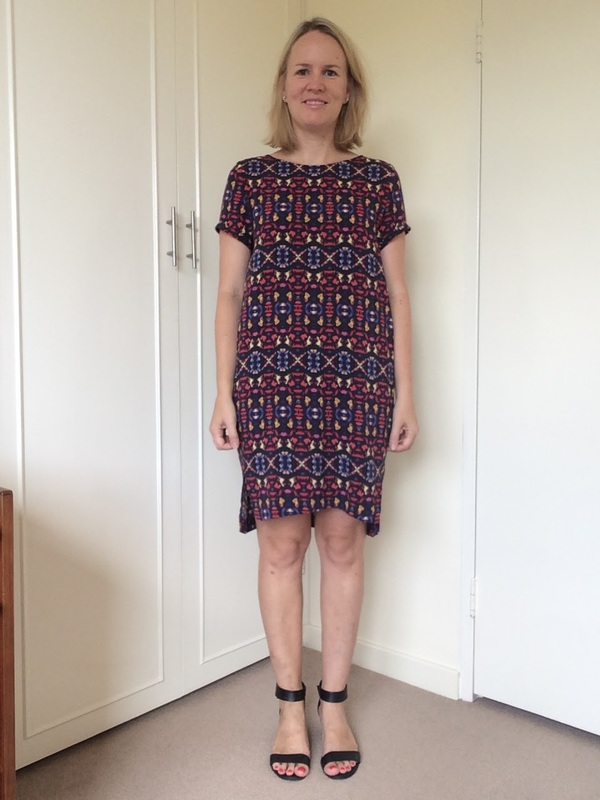 i made a size 38 which most closely matched my bust measurement. my waist and hip measurements are in excess of the size 38 but given the dress has an elastic waist and gathered skirt this is not a problem. 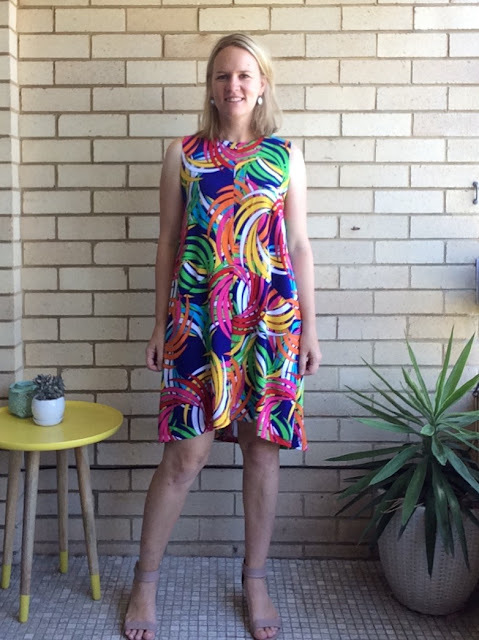 i cut out the cap sleeves but i decided not to attach them in the end as i want to wear a skivvy under the dress and i decided i liked the sleeveless look when trying on the half finished dress. 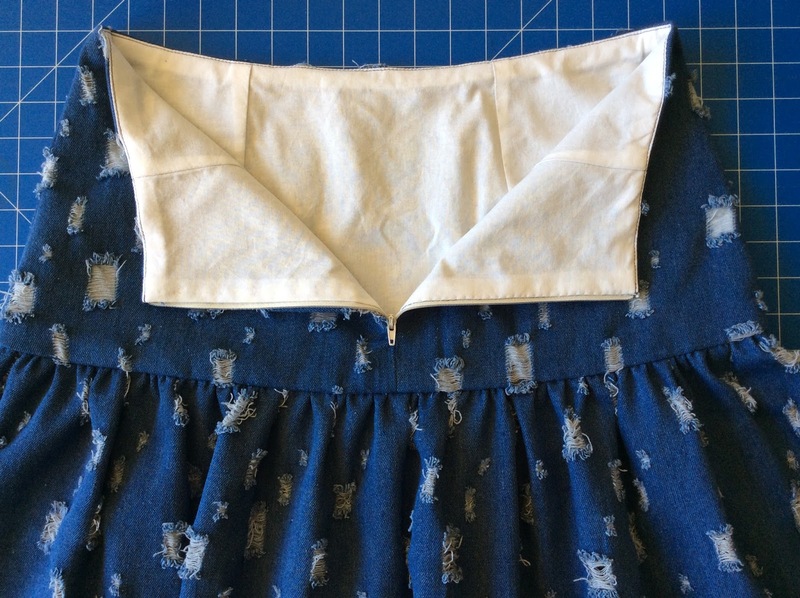 i also cut the back bodice on the fold instead of it having a back seam and stitched down the neck facing around an inch or so from the neck edge. as finished, the dress is still quite blousey in the bodice at the waist (even though essentially i sized down at the waist) and very gathered in the skirt. if i was to make this again i wouldn't make the skirt rectangle as wide as the instructions require. i, like kristy mentions in her review didn't care for the way the instructions direct you to attach the elastic to the waist seam. instead i made the seam allowance wider and made a casing to insert the elastic through. i made a 1 and a 1/4 seam allowance but given the amount of gathering this creates quite a bit of bulk which you can see below. a wide belt covers any bulk but to me wearing it it feels a bit bulky. 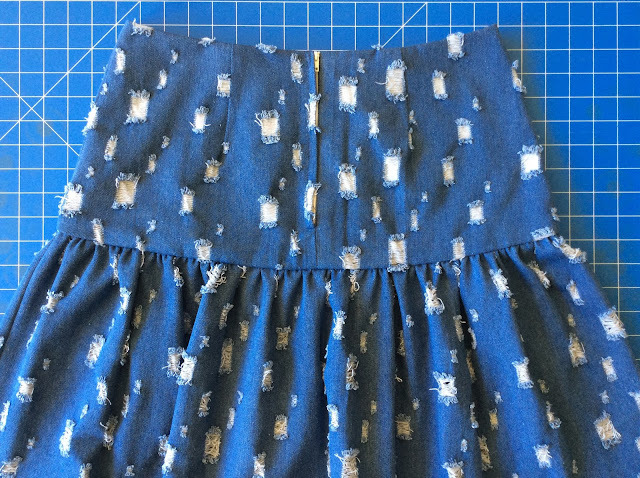 i didn't trim the bodice seam allowance when making the casing, i would do this if i made the dress again to assist with reducing the bulk, in combination with reducing the width of the skirt. one thing i am a bit bummed about is the fabric had quite a few faults that i did not notice until cutting the last piece - one of the skirt rectangles. i managed to cut the rectangle with just one of the faults included as i didn't have enough fabric left to cut a fault free rectangle. you can see the fault in the photo below, it looks worse in real life, so i made it the back skirt piece so at least i don't need to look at at. i suppose its a good lesson about checking over your fabric if you buy it on line. 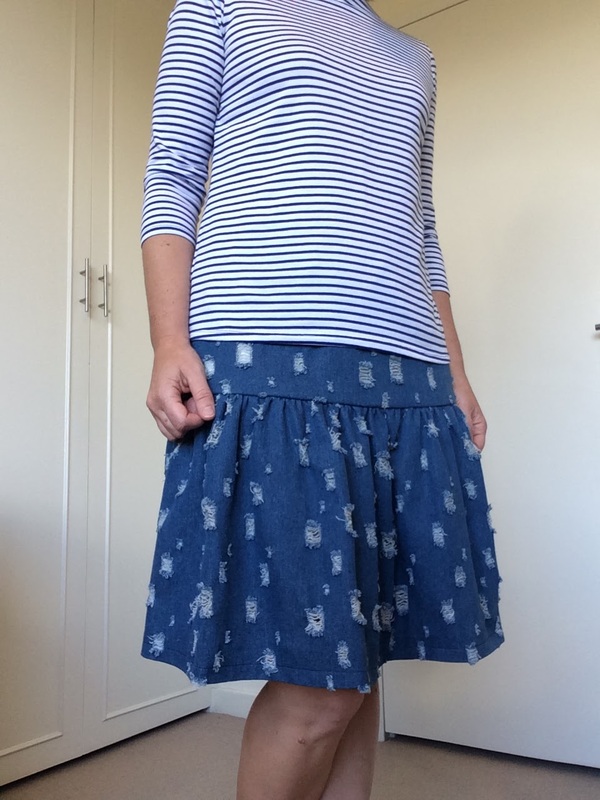 overall i am pretty happy with this make, i think it will get lots of wear to work over winter paired with a skivvy and a jacket. however i think its unlikely i will make another. 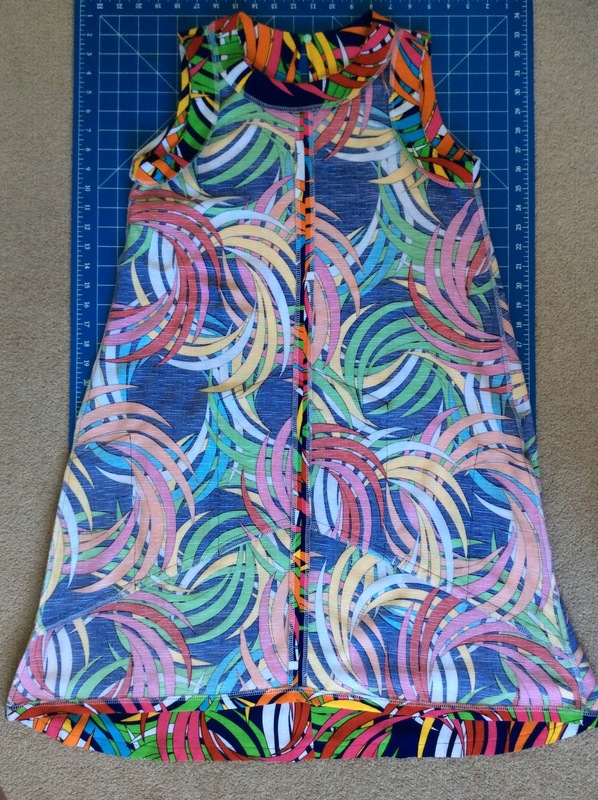 i think i would just prefer to make a few more darts in the bodice and go for a proper fit and flair dress as this one was little fiddly with the elastic waist and i prefer the more fitted bodice look. 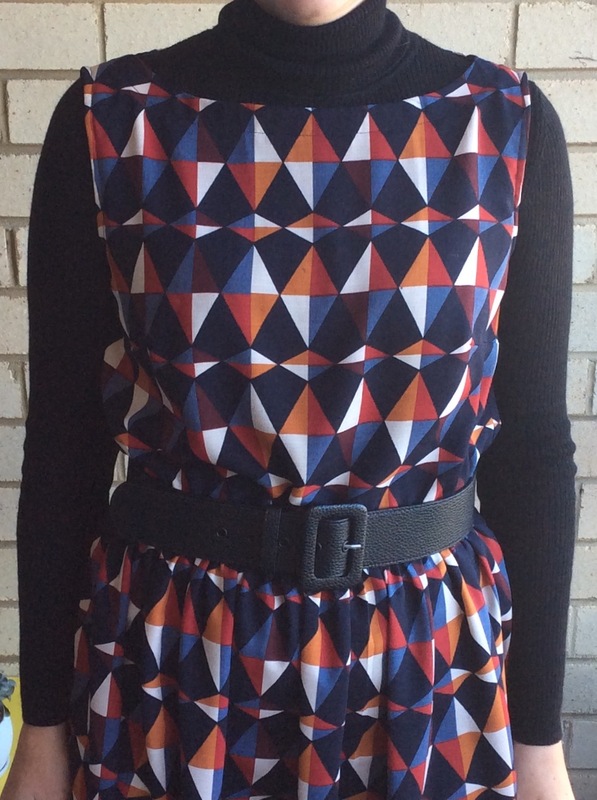 i might be swayed though as i wore the dress to work today and i received some lovely comments about it. as always i am really looking forward to seeing what lara has made - i have no idea or any clues as to what it is this time. finally, does anyone have any idea as to why burda would call this submarine dress?? let me know in the comments section! 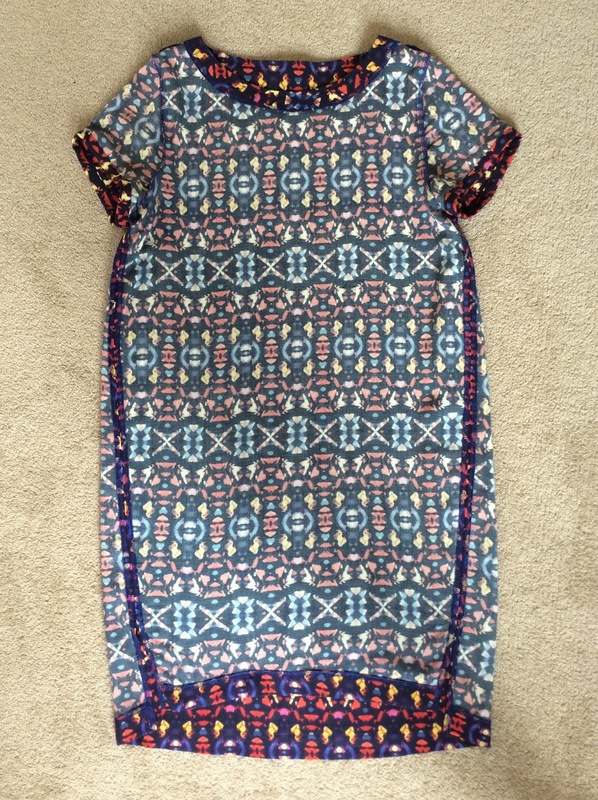 this is my third attempt at a named patterns inari tee dress and it is definitely a case of third time lucky. i bought the pattern when it was first released as i liked the slight cocoon shape and high low hemline. my first two versions were disasters that never got finished. the first one i made in merino knit but i cut it slightly off grain which meant it had an odd drape. the second one i made in a stretch sateen but after sewing up the front and back i quickly worked out the stiffness of sateen is not great for this design. for this third version i used a lovely drapey rayon from the remnant warehouse and its a definite case of third time lucky. i um'ed and ah'ed a bit over what size to make, my measurements best match size 40 in the size chart. in the end i went with a size 36 making this decision based on the finished measurements chart. the 36 would give me a couple inches ease in the bust and 3/4" ease at the hips. i basted the front and back together at the side seams to check the fit and see if i needed to let the hips out a bit, but i was happy enough with the fit so went ahead and finished the dress as a straight 36.
now the dress is finished i am very happy with the overall fit - snug enough for a 'sack' dress, but still enough room to move. i quite like the high low hem line. 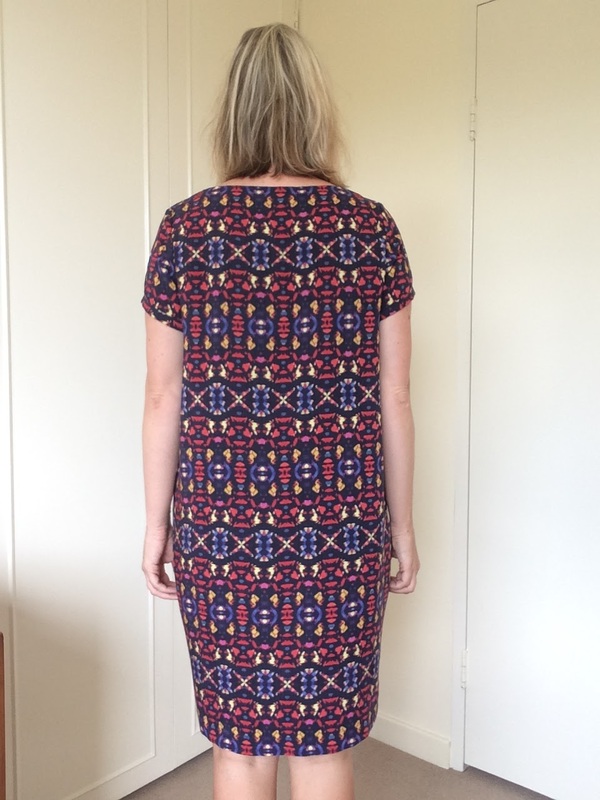 the high hemline at the front and side splits are a bit higher than i would normally wear to work, but given the low back hemline i think overall the hemline is ok for my work place. the dress does not have any closures and went together easily and quickly. so beyond choosing an appropriate fabric and size there is not that much else to say about this dress. it would be a great pattern for a beginner given the straightforward construction. i am often tempted to put fish eye darts in the back of sack dresses to reduce sagging at the back and give them a bit more shape, but the back of this dress is pretty straight up and down so i wasn't tempted to put in any darts. its a bit hard to make out the cocoon shape when the dress is being worn, but the photo below gives a good indication of the shape. 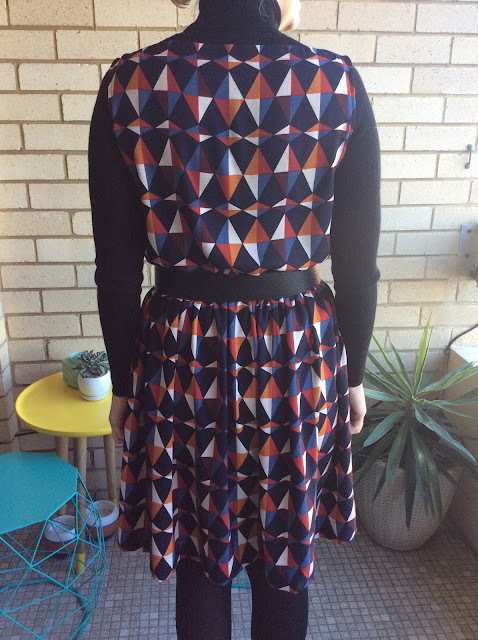 i must admit that when i was sewing up this dress and had the front and back basted together i tried it on and thought i'd made another dud. but i persisted with putting the sleeves in and finishing the dress. i'm so happy that i did as now i have worn it once to work i think its a great comfy dress. again i must admit when i first tried on the dress i was thinking that i would be putting the pattern in the recycle bin, but i am now planning another in a black and white rayon i have in my stash. third time lucky - winner winner chicken dinner! 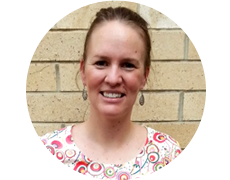 Hi I am Emma, thanks for stopping past my blog. 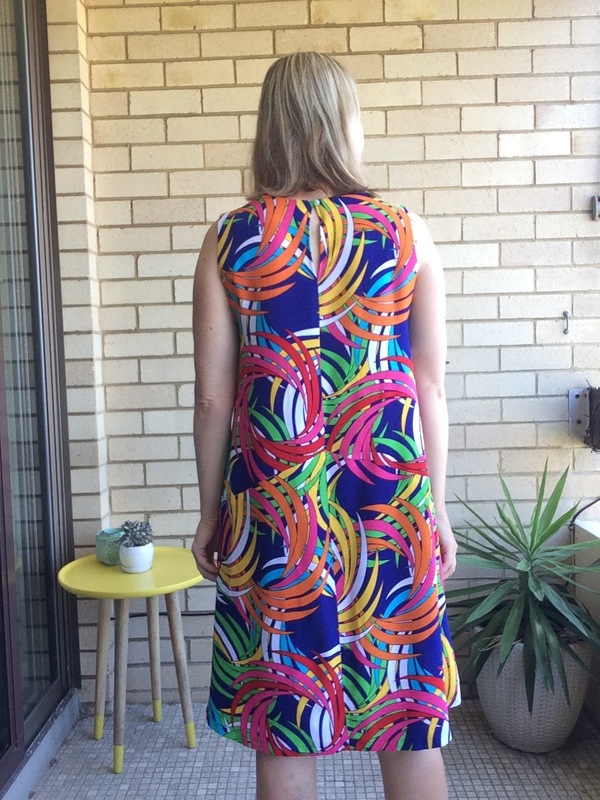 I live in Sydney and have recently started sewing again after a long break. 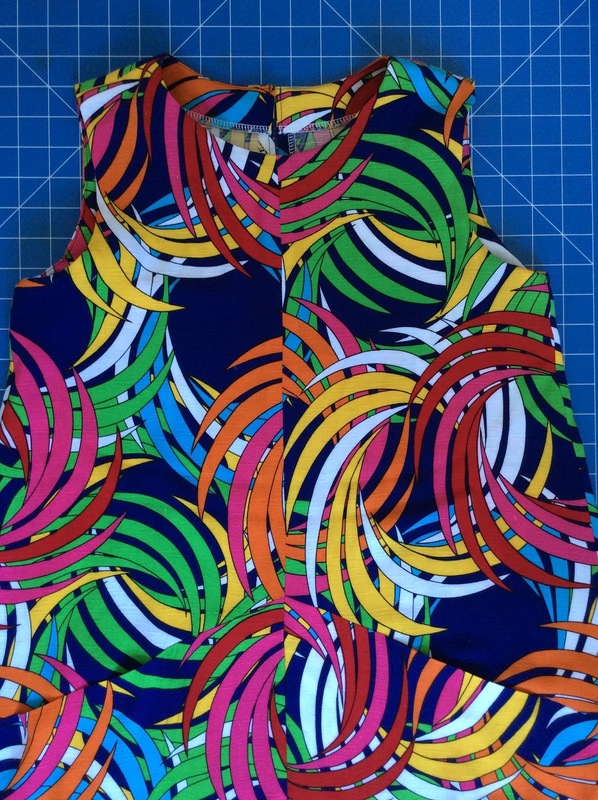 I can't believe just how helpful the online sewing community is - I make way less duds these days. I hope you find some of the things on this blog useful too. Design - Two By Zero. Powered by Blogger.